Social Networking sites like Facebook and Twitter are all the rage nowadays. Everyone wants to be part of the social networking group but some may find the typing tedious or simply time-consuming. The Lighthouse SQ7 by Adela Voice and Smart Devices bring social networking to a new frontier by introducing the portable voice-recognition social media device. The Lighthouse SQ7 has a 7-inch touch screen, 800×480 resolution, WiFi b/g connectivity, a Samsung ARM S3C6410 667MHz processor, 128MB DDR memory, 1GB of flash storage and a 4500 mAH rechargeable battery lasting up to five hours of use or twelve hours in standby mode. All that is needed is for users to speak into the device and the voice-recognition feature will transcribe the speech into the corresponding Twitter or Facebook website. The SQ7 can also be converted into a digital photo frame complete with a stand to display your Facebook photos. Measuring 7.8″ x 4.7″ x 0.94″ and weighing just about a pound, the Lighthouse tablet brings Facebook and Twitter closer to die-hard fans. 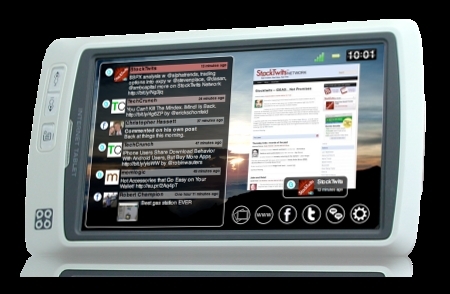 The device runs Linux Ubuntu and is available for $249 from its dedicated website, LighthouseTablet.com.